Use a 10 x 6-inch pan. The pan I use do not require any cooking spray, but you may wish to add some to your pan. 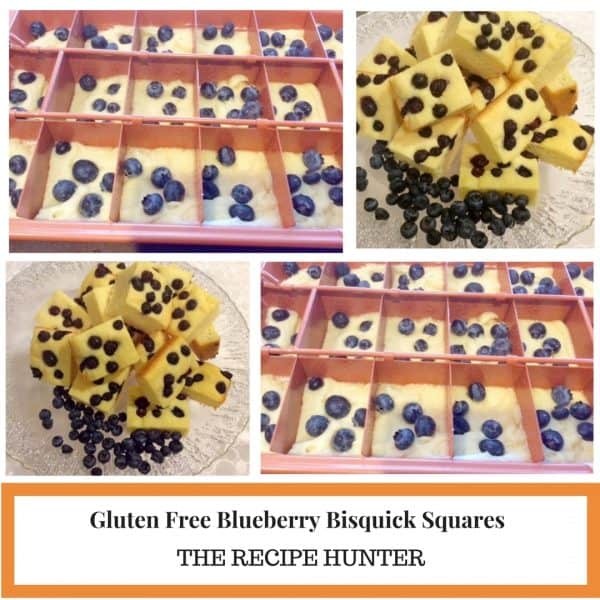 Mix all ingredients except the blueberries very well until all ingredients fully incorporated and well blended. Place the ‘cutter’ (here I did use cooking spray) in the pan and press down into the dough. Decorate with the blueberries, as many as you like and prefer, and slightly press them into the dough. Bake in preheated oven for 20-25 minutes, or until a skewer comes out clean. Take out, and leave on the countertop to cool down properly. Take out the ‘cutter’ and voila you have perfect, evenly cut squares! Store in an airtight container in the fridge and enjoy together with your coffee or with your friends. If you like it, you can make a glaze and drizzle it over, but I am not big on the added sweetness. Bakers Note: This was an experiment, so next time I will add ½ cup of applesauce into the mixture as another test, but I am happy with the outcome as is. Looks delicious 🙂 What’s a Bisquick? Sorry, never heard of it. I just bought gf bid quick for the first time today- this is what I’ll try it out in! Oh did you find them dry? No not dry but I like to experiment with more juicy fruit next time. Had visitors today and they also like it. This sounds delicious Esme. Shared this on my FB #thellyscucina page for my later use. Thanks. I didn’t even know there was gluten free Bisquick! So many options just opened up! Thank you. They look delicious, good luck trying out gf! Thanks, some do work and other does go to the garbage can unfortunately. These look lovely and healthy!